Paintballing is great fun and a physically challenging team-orientated group experience. 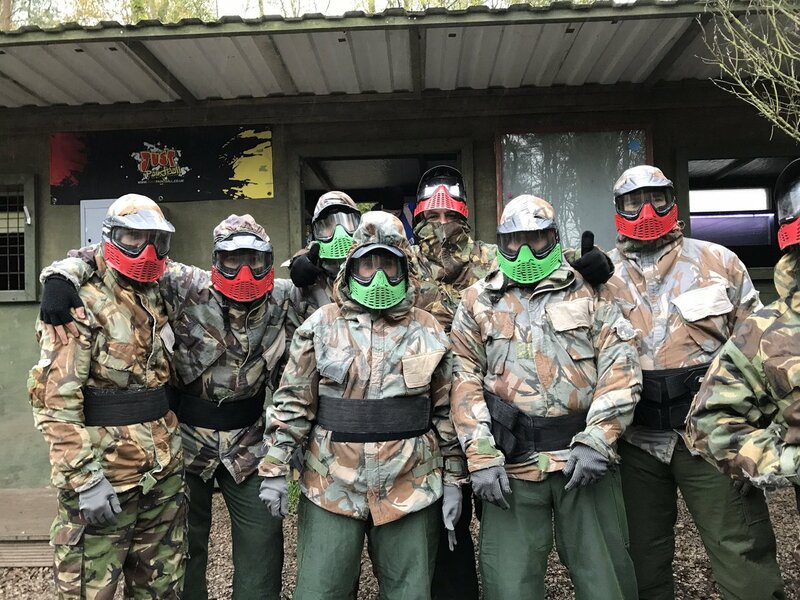 We have considerable experience in running paintball group games for birthday and stag parties, sports clubs, schools and colleges and company team building events. 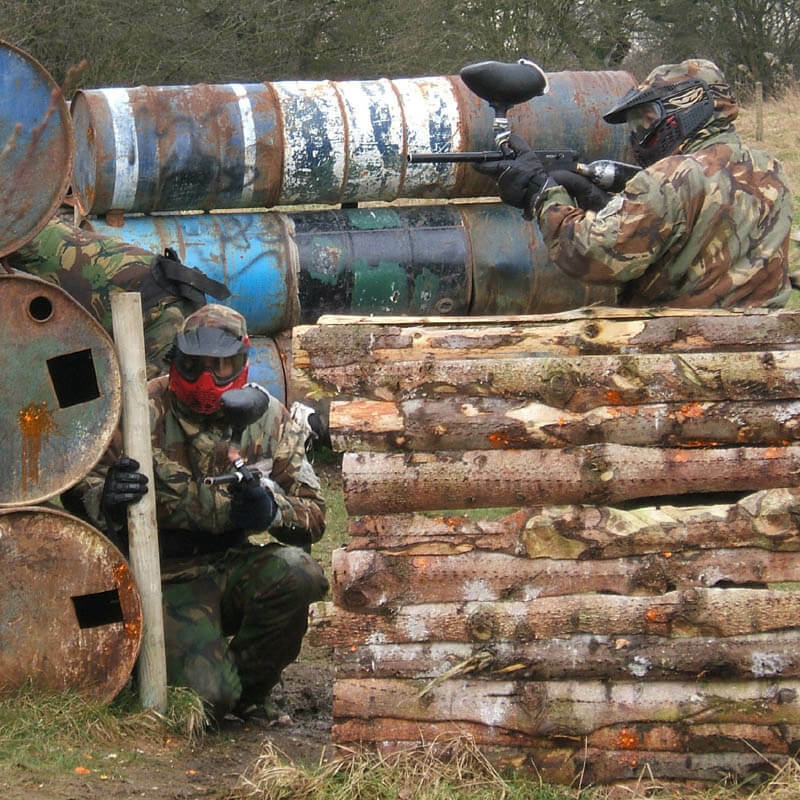 Bedlam paintballing Chorley is located in the northwest of England, on the Standish / Chorley border, 4 miles north of central Wigan. Because we are near junction 27 of the M6 and junction 6 of the M61, driving to our site on Saturday or Sunday mornings is quick and easy. As a guide, conservatively it takes 20/25 minutes from Bolton or Preston and 30/40 minutes from Manchester or Liverpool. When you arrive, you will be greeted by one of our Marshalls. Everyone congregates in the car park area until all paintball party members arrive. You will be asked how you want to split up your group into playing teams, the reds and the greens. Splitting your group is generally a good idea, you end up playing with and against someone you know, and adds to the banter that goes on between the reds and greens throughout the day. In certain circumstances, booked groups stay together, and this is usually when the group is small, less than 4 people. You will then be asked to fill out a registration form, and formally split your group into red and green teams. The group organiser will be asked to collect any remaining admission and rental fee due from each player and pay at the counter. At this stage, there is also the opportunity to bulk pay for paintballs in advance of the games. The kit – colour coded goggles, hooded jackets, pants, battlepacks and gloves – are distributed to all players. Our Marshalls help you and explain how to wear these items, especially the goggles which should be a good comfortable fit – especially over the bridge of your nose – so that they will not steam up during the paintball games. There is then a compulsory safety briefing in which the rules of paintball at our venue are explained. Please listen very carefully to this briefing. Paintballing is a safe sporting activity if the safety rules are stuck to, and just like any other team sport, breaking the rules can lead to injury. We are very serious about our safety rules, and we expect you to be too!! You are then given your paintball guns; a marker, gas bottle, hopper and safety plug. Paintballs are purchased and then it’s off we all go into the woodland game areas – it’s game on!! Our game scenarios are dynamic and not restricted to firmly fixed boundaries. The site is split into four very large playing areas, and whilst these playing areas are separate game zones in their own right, we also play games to and from each of the game zone central points, allowing for a total of six additional paintball gaming scenarios. Bedlam Paintball Chorley. The best paintballing deals in Chorley. 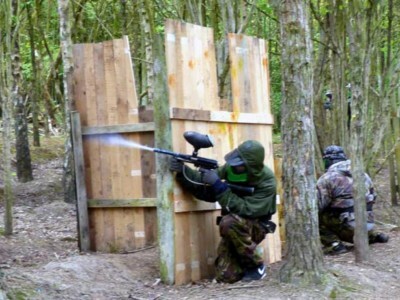 Go Bedlam Paintballing Chorley is a pay as you go package to play paintball in Chorley . The package includes entrance fees, game fees, paintball insurance, paintball marker gun, paintball hopper and propellant for the whole day.